What Are the Latest Advancements in Enterprise Medical Imaging? Most hospitals use PACS System to store and archive medical images. However, doctors often need to login to multiple programs to access images generated by multiple departments. The reason for this inconvenience is that the vendor software used by different departments are not always compatible. Vendor-neutral archives (VNAs) help correct this issue by storing DICOM-based medical images and putting them in a vendor-neutral format. The system can then share the archived images across the network without requiring vendor-specific viewers. VNAs paved the way for enterprise-level imaging solutions. Hospitals require imaging solutions that are accessible by every department and that can easily be shared with other facilities. The following are some of the latest developments in enterprise medical imaging. Enterprise medical image archiving has allowed vendors to create viewers for mobile devices. Doctors now have the option to view patient information directly from their phone or a tablet. Healthcare facilities can remotely view the images from any device, increasing the convenience of enterprise archiving. Another development is the use of cloud-based PACS and VNAs. Hospitals are implementing cloud-based solutions to increase the speed and efficiency of sharing medical images. This also allows healthcare facilities to reduce the cost of maintaining local archives with vendor-managed equipment. Cloud-based solutions may result in increased access to patient information between locations. After a patient moves to a new location, their new physician could easily retrieve their information from their previous physician. If a doctor needs to consult a specialist in another state, they can quickly receive an audit of their diagnosis for faster treatment. With enterprise-wide medical image archiving, it is easier to incorporate analytical tools to evaluate the patient experience and provide operational metrics. Algorithms are used to detect patterns and help improve the accuracy of diagnoses and treatments. Hospitals can also gather key performance indicators (KPIs) for the entire hospital or individual departments. Using these indicators, facilities can monitor and evaluate patient care as well as the efficiency of each department. While VNAs and DICOM-based medical images have helped address the compatibility problems of medical imaging devices, more vendors are starting to adopt technologies and software to improve interoperability. Enterprise imaging vendors are using VNAs and universal viewers to ensure that their clients receive more efficient solutions. This includes reducing the variety of hardware and software that hospitals will require to provide medical imaging for different departments, reducing the cost of image archiving. Data management is another focus of the latest enterprise medical imaging solutions. Nearly 25% of doctors are unsatisfied with the data management features of their current medical archiving system. Better access to data helps reduce the time spent on administrative tasks. This may improve the operational efficiency of the healthcare facility, and allow doctors to spend more time on their primary responsibilities. One of the biggest advances in enterprise-wide medical imaging is the ability to easily share information between organizations. Healthcare organizations across the country and access health information for patients in other parts of the country. Currently, if a doctor requires a medical image from another provider, the image is copied to a CD and then given to the patient to give to the specialist. This is an unnecessary step that is completely eliminated with the use of enterprise medical imaging. The latest enterprise solutions are designed to make it easier for doctors to access, share, and manage patient health information records. New medical imaging tools are being created to help doctors reconcile differences between a patient’s diagnosis and their health records. This may result in more accurate recording and fewer medical errors. Medical imaging technology has constantly improved over the years. There are breakthroughs every year and keeping up with these developments allows doctors to continue offering the very best treatment to patients. The goal of enterprise-wide medical imaging is to ensure that doctors have immediate access to patient information, regardless of which department created the medical image. In the past, a doctor may need to physically visit the radiology department to view a medical image. 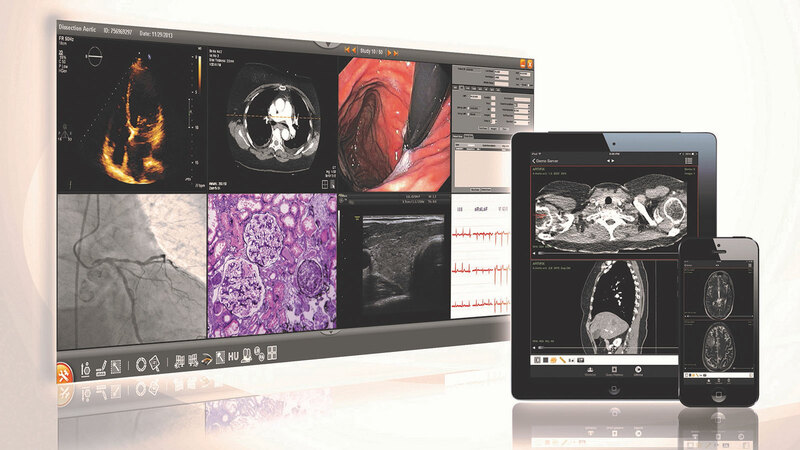 With the latest technology, doctors can view the image from any device or workstation.